The Mars Volta is an American progressive rock band that hails from Long Beach, California. 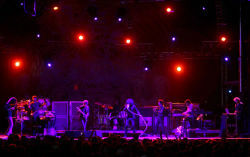 The band is known for their energetic and improvised live shows as well as for their concept-based studio albums. Generally considered as a progressive rock band, Mars Volta is known for their music with punk, jazz and Latin music influences. The Mars Volta stemmed out from being a side project of Cedric Bixler Zavala and Omar Rodriguez-Lopez, members of the band At the Drive-In. This side project was then known as the band De Facto. The side project became Mars Volta in 2001 when Bixler Zavala and Rodriguez-Lopez decided to end their stint as members of At the Drive-In, citing creative suffocation and frustration over the band’s growing success on the mainstream. The band’s first album was De-Loused in the Comatorium, an LP released on June of 2003. The album became a hit, both critically and commercially, selling over 500,000 copies despite very limited promotion given to it. This was followed by Frances the Mute, the band’s second album that was released in 2005. It was also well received commercially, able to sell 123,000 copies in its first week and debuting at the fourth spot on the Billboard Album charts. Next came Amputechture which was released in September of 2006. The album debuted at the ninth spot on the Billboard Top 200 for selling 59,000 copies on its initial week of release. So far, their fourth album, The Bedlam in Goliath which was released on January of 2008, became the band’s most successful to date, debuting at number three on the Billboard 200.